Shemot/Exodus 14:14 The L-rd will fight for you and you shall keep silent. HaShem is going to do. Something will happen, he assures them; something will. Rashi explains that "the word here means 'on your behalf'. Likewise in 'the LORD is fighting for them' (v. 25, NJPS) or in 'Do you have to contend for Baal?' (Judges 6:31, NJPS)." Umberto Cassuto invites a comparison between the first phrase of this verse and that of the third verse of Moshe's "Song at the Sea" after the Israelites have crossed through the sea on dry land and the Egyptian army has been drowned. There it says , translated either "The L-rd is a man of war" or "The L-rd is a warrior". In that verse, the word 'man' has been inserted and the verb form has changed to a feminine noun derived from the same root. The L-rd who will fight has become the L-rd who is a warrior and has fought. Rather to the chagrin of some commentators who are uncomfortable with images of HaShem fighting or being angry, the Bible - in both the Hebrew and Greek parts - quite unabashedly repeats the image a number of times: for example, "I trod out a vintage alone; of the peoples no man was with Me. I trod them down in My anger, trampled them in My rage; their life-blood bespattered My garments, and all My clothing was stained" (Isaiah 63:3, NJPS) and "From His mouth comes a sharp sword with which to strike down the nations, and He will rule them with a rod of iron. He will tread the winepress of the fury of the wrath of G-d the Almighty" (Revelation 19:15, ESV). Baal HaTurim reports a marginal note in the Masoretic Text and says that "this word appears twice in the Tanakh: (i) here; and (ii) 'If you would only keep quiet It would be considered wisdom on your part' (Job 13:5, NJPS). Moshe said to the people, 'There is no reason for you to cry out, rather, remain silent and that would be a wise thing for you because HaShem will fight for you - you would then be showing trust in G-d.'"
Mekhilta take the wider view of the first phrase, "The L-rd will fight for you" to say: "Not only at this time, but at all times will He fight against your enemies. 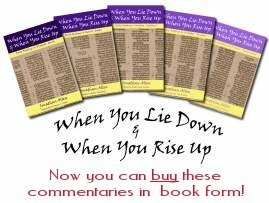 Rabbi Meir says: If even when you stand there silent, the L-rd will fight for you, how much more so when you render praise to Him! Rabbi says: Shall G-d perform miracles and mighty deeds for you and you be standing there silent? The Israelites then said to Moshe, 'Moshe, our teacher, what is there for us to do?' And he said to them, You should be exulting, glorifying and praising, uttering songs of praise, adoration and glorification to Him in whose hands are the fortunes of wars, just as it is said, 'Let the high praises of G-d be in their mouth' (Psalm 149:6). And it also says, 'Be exalted, O G-d, above the heavens; Your glory be above all the earth' (Psalm 57:12). And it also says, 'O L-rd, You are my G-d, I will exalt You' (Isaiah 25:1). At that moment the Israelites opened their mouths and recited the song: 'I will sing unto the L-rd, for He is highly exalted' (Shemot 15:2)." Not silence at all, but loud shouts and whoops of praise and worship. So is this a call for silence or for praise? This is significant in some of today's modern contexts, where the response to spiritual warfare is to go into (often loud) praise and worship until the leadership sense in the Spirit that the attack has ceased or the battle has been won. Pentecostal churches in particular see praise and worship as enabling or releasing G-d to act in a situation, but is that what our text teaches? Terence Fretheim makes a telling point: "This is not a word asking the people 'not to move a muscle'. It is not a call for passivity, as if angels will now come and carry them across the sea. It is a word for silence. What the people might have to say, whether in lament or battle cry, will have no bearing on what is about to happen. Neither Israel's words nor deeds will add to what G-d is effecting on their behalf. "4 It is almost as if, Fretheim is saying, that the Israelites can do whatever they want, because G-d's actions are completely independent of what they do. He will do exactly what He has already decided to do and He doesn't need their help or their permission to do it. Lots of questions spring from this, but let's just focus on one of them. Do we panic and wail when the going gets tough, or do we trust in G-d and simply watch and wait - in silent faith - for what He will do? Certainly, we are commanded to pray: we are told to cast "all your anxiety upon Him, because He cares for you" (1 Peter 5:7, NASB). Yeshua tells us not to witter aimlessly or repetitively when we pray because "your Father knows what you need, before you ask Him" (Matthew 6:8, NASB). He tells the disciples not to worry about food, drink or clothing for "NASB). Rav Sha'ul is confident that "And my G-d shall supply all your needs according to His riches in glory in Messiah Yeshua" (Philippians 4:19, NASB). But are we commanded to do any more? Having prayed the matter though once or twice, do we need to do anything more? Well, Yeshua's parable about the unrighteous judge gives us a couple of clues. Firstly, He is not teaching us that G-d is like the unrighteous judge, who only gives reluctantly in to our requests if we nag Him silly. Luke starts by telling us that Yeshua told the story "to show that at all times they ought to pray and not to lose heart" (Luke 18:1, NASB). He ends it by saying that if even the unrighteous judge could be nagged into doing the right thing, how much more will "G-d bring about justice for His elect, who cry to Him day and night, and will He delay long over them?" (v. 7, NASB). I think this means that we need to keep reminding our Father, at reasonable intervals, about pressing matters; that we should bring everything before Him immediately they occur, even if some other matters are still outstanding; and that in general, we should expect answers - of some kind, not necessarily exactly what we wanted or expected, but an answer - sooner rather than later. 1. - Umberto Cassuto, A Commentary on the Book of Exodus (Jerusalem: Magnes Press, 1983), page 164. 2. - Peter Enns, Exodus, The NIV Application Commentary, (Grand Rapids, MI: Zondervan, 2000), page 273. 3. - Walter Brueggemann, "Exodus", in The New Interpreter's Bible Commentary, Vol I, edited by Leander E. Keck, (Nashville, TN: Abingdon Press, 2015), page 368. 4. - Terence E. Fretheim, Exodus, Interpretation, (Louisville, KY: Westminster John Knox Press, 2010), page 157. Application: Are you a shouter and hollerer when it comes to prayer and seeking the will and action of G-d? If so, perhaps you need to hear Moshe's words (paraphrased): G-d has heard you and is already on the case; you will get an answer in due course. You should remind Him periodically. In the meantime, demonstrate your faith by piping down and stop nagging. 07:21 13Jan19 Judith Chesney: I like the way you give different peoples' approaches to interpretation of the text. I need to learn grammar more so your lessons help me grasp the true meaning.